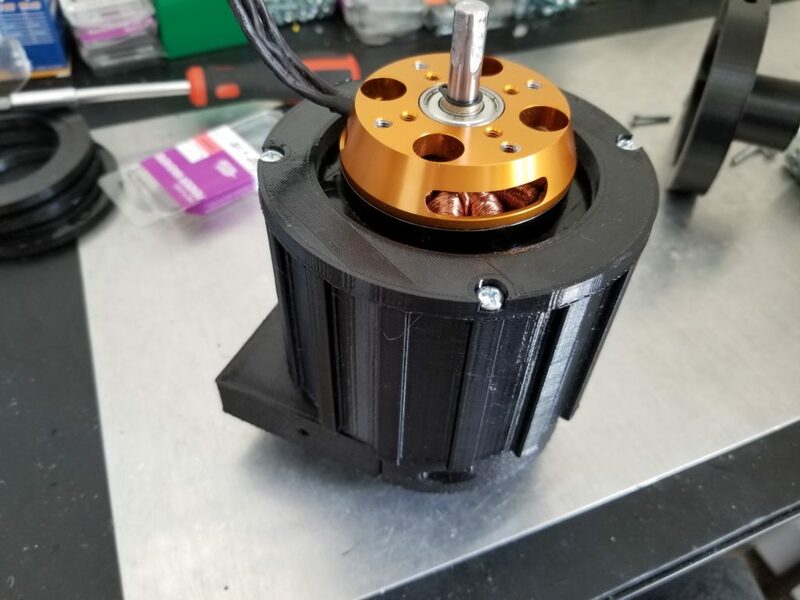 This week I worked on making a 3D printing a geared wheel hub drive for a Keda 190KV brushless motor. I designed it in Designspark Mechanical. 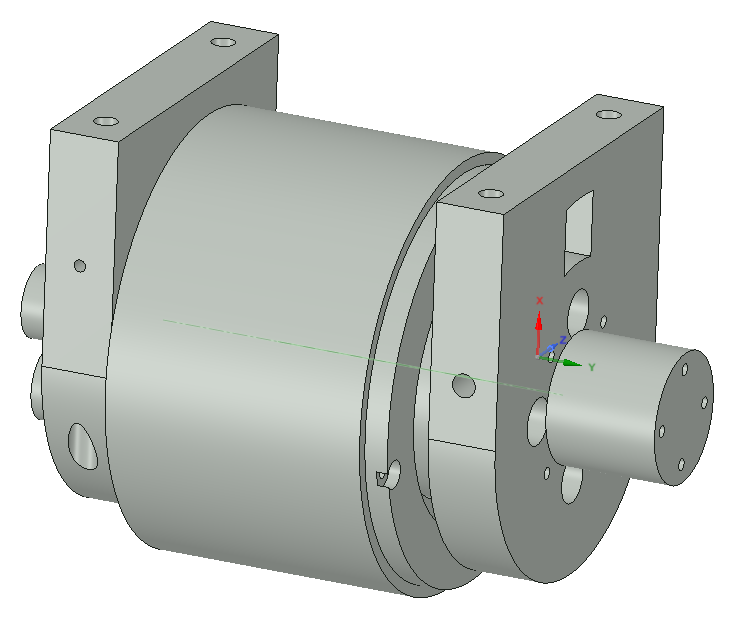 First I designed bearings that go around the motor. The motor is an outrunner, so the outside spins when the motor is powered on. 3 of them are pushed onto the motor, as shown above. 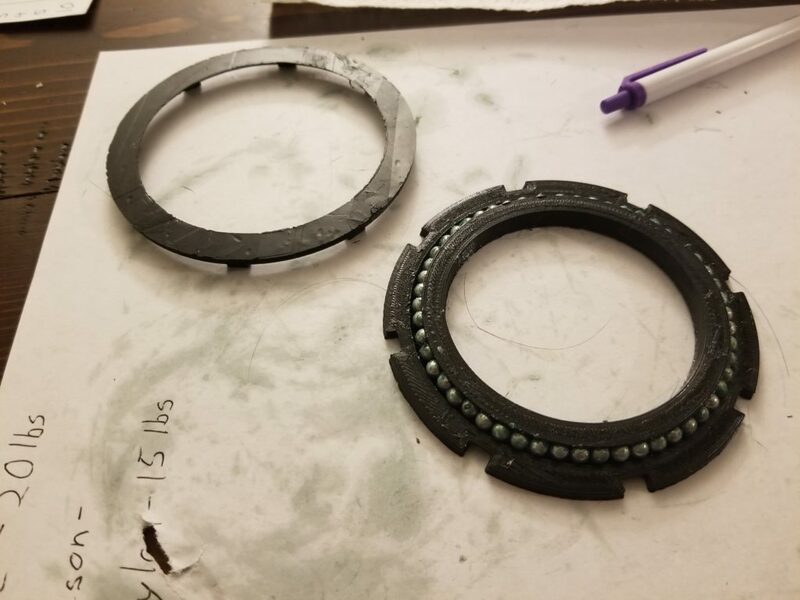 I also 3D printed 2 spacers to keep the bearings from moving. Also shown below is the attachment I made that screws into the rear of the motor. A 5/16″ square rod is inserted into the attachment. Shown above is one of bearings. The bearing is made with 4.5mm BBs. The cap (on the right) is glued in. I used Loctite Super Glue Gel Control and Gorrilla Super Glue Gel Control. Both seemed to work very well. The other end of the square shaft is inserted into the sun gear of a planetary gear, shown above. The gear was modified from this design by emmett on Thingiverse. 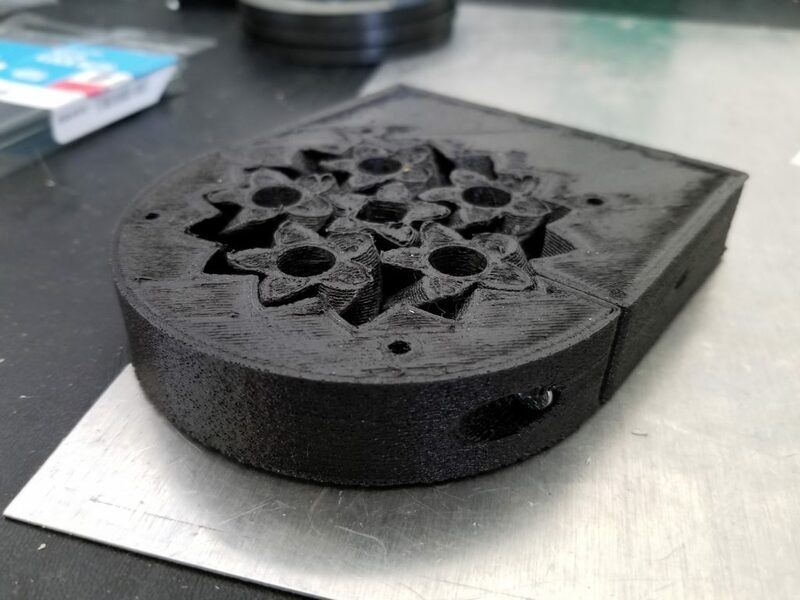 With his design, you normally print the ring, planets, and sun gears all at once. The parts will be slightly fused together, so you need to break them apart by forcing the sun gear to turn. Instead, I broke the ring gear into 2 pieces so that I could print each part separately and then assemble them. Shown above is the Y carriage that attaches to the planetary gear. 5 bolts are going through it. The bolts are what will attach the Y carriage to the planet gears. The motor and bearings go inside of the Y carriage (or hub I guess you’d call it? ), as shown below. 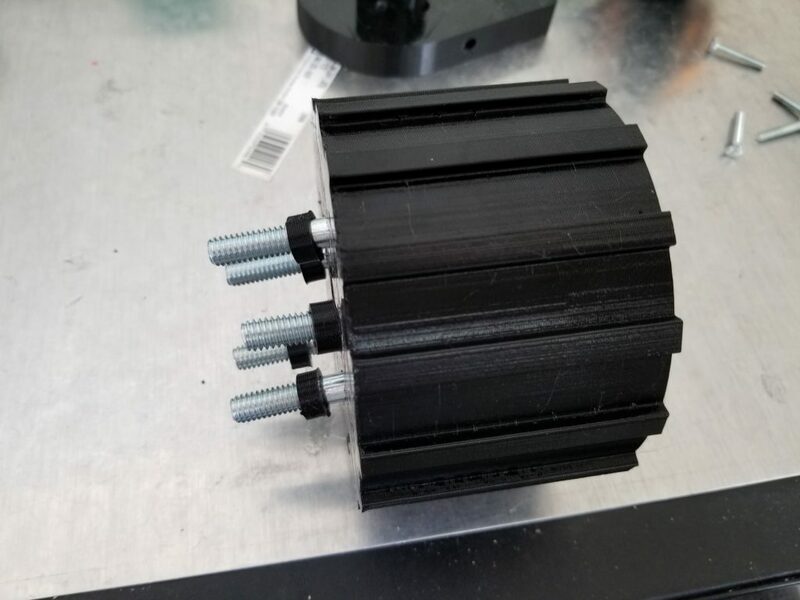 I printed some spacers that go on the bolts, shown above. Shown above the Y carriage is attached to the planetary gear. I used nylon nuts to secure it. The nuts are screwed down just enough to prevent the bolts from wiggling around as the gear spins, but not enough to cause extra friction. Shown above, the motor and bearings shown in Figure 1 are inserted into the Y carriage hub. Next, I made a cap that fits over the other end of the Y carriage hub to keep the bearings from coming out. Shown above, I mounted a piece to the front of motor. 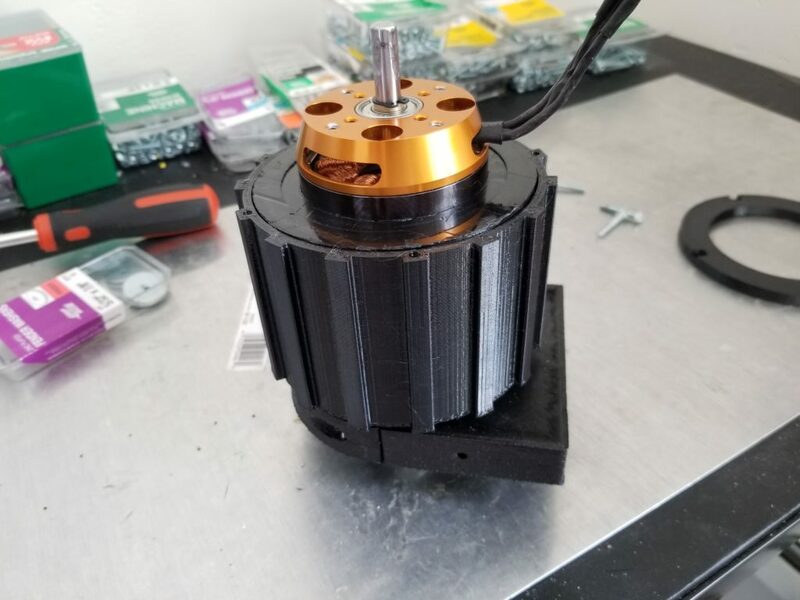 Finally, I made a cap that fits over the shaft of the motor. Shown above is my first test of the wheel hub drive. You can see when I zoom in on the planetary gear that the sun gear is spinning faster (4 times faster) than the planet gears and the Y carriage. This is the gearing that I wanted to achieve. 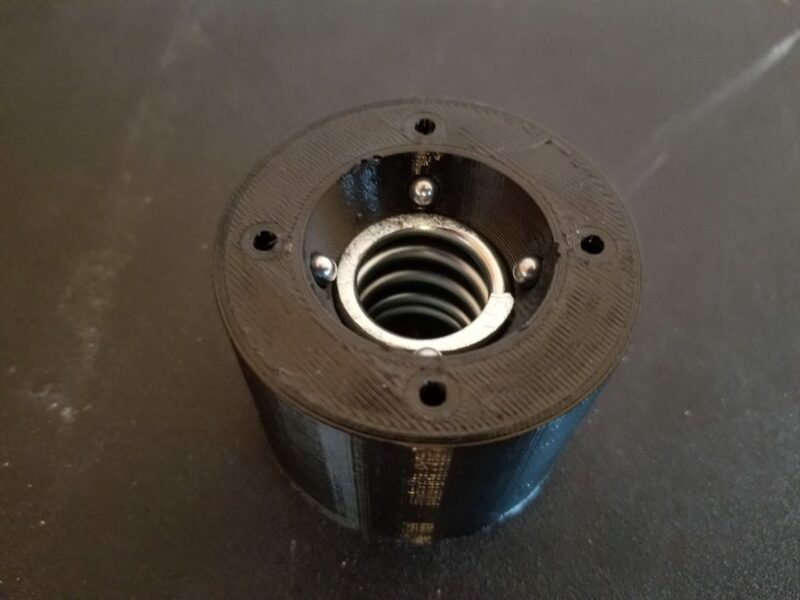 Since I didn’t need it for testing, I didn’t print the tire that will fit around the Y carriage hub yet, shown above in black. There are several improvements that I’d like to make to the wheel hub drive. First, the planetary gear was printed with too small of a tolerance. The ring, planet, and sun gears fit together too tightly making them hard to turn. The gears are generated using an OpenSCAD file and the tolerance is one of the parameters. Increasing the tolerance should solve this issue. Second, I’m going to replace the spacers shown in Figure 7 with metal washers instead. I believe washers will have less friction and better handle the heat generated by the turning. Third, I believe I only need 1 bearing, not 3 as shown in Figure 2. I would only leave 1 bearing on the end to support Y carriage hub. With only one bearing, there will be less friction. However, I’m worried that if I take the middle bearing out, the Y carriage hub will strain under the weight I plan to put it under. To help, I’m going to try to redesign the Y carriage hub so that I can reinforce it with at least 8 1/4″ steel rods. Fourth, and finally, I’m going to see if I can make the bearings shown in Figure 2 without using glue. Even though the glue seemed to work very well, I’m worried that it will degrade over time. I tried to redesign them to use snap-fit joints instead, as shown below. However, they didn’t seem to work too well. 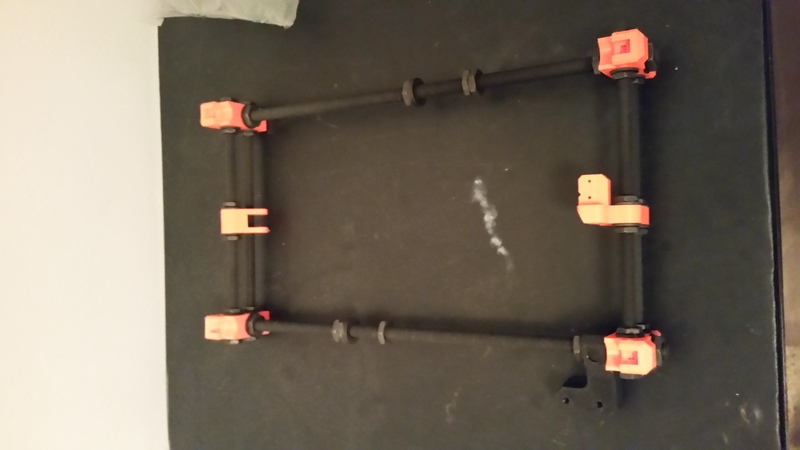 I may try to make the snap-fit joints work, but right now I’m thinking that I might be able to use zip ties instead. I will make these improvements and then post the results in part 2. If I’m happy with the results, I will upload the 3D model files to Thingiverse. Stay tuned! Ball Transfers I 3D printed. You can download the 3D models on Thingiverse. You can buy ball transfers from McMaster-Carr for around $3, so a while ago, last year sometime, I bought some. The ones I bought were pretty noisy. They were so noisy that I couldn’t use them for what I was working on. At the time I thought I could try to make my own, but I didn’t want to spend the time to do so. But 3 weeks ago I decided to try to make my own. Ball transfers have one large sphere that supported by a number of small ball bearings. For my designs, I bought the large spheres from McMaster-Carr. The small ball bearings I used are just 4.5mm BBs. The designs in this section I ended up not using because other designs worked out better. 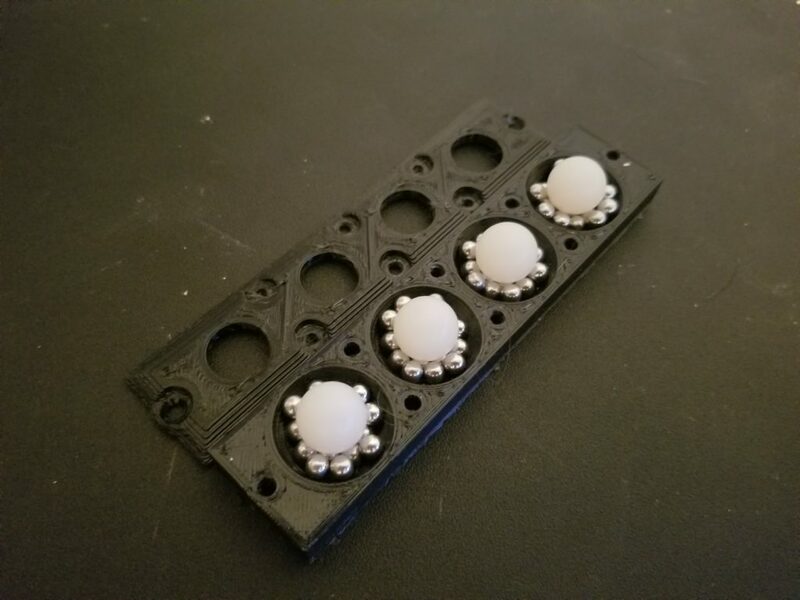 Design with pockets for each ball bearing. Design with grooves that ball bearings would move along. 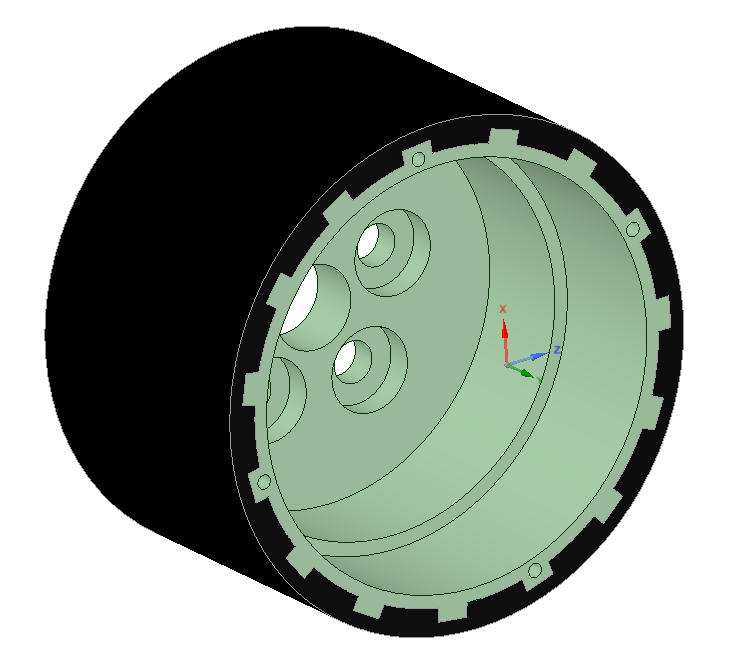 A design where the 1″ sphere rests on the spring. Shown here are a couple of the ball transfers I bought from McMaster-Carr. I tried 3D printing a cover for them out of TPU to see if the cover would help with the noise, but it didn’t. I tried some other variations of the designs above. I experimented with making the hole that the bearings and sphere sit in a little bigger, or a little smaller. For the caps that go over the sphere, I experimented with different sizes for the hole that the sphere goes through. 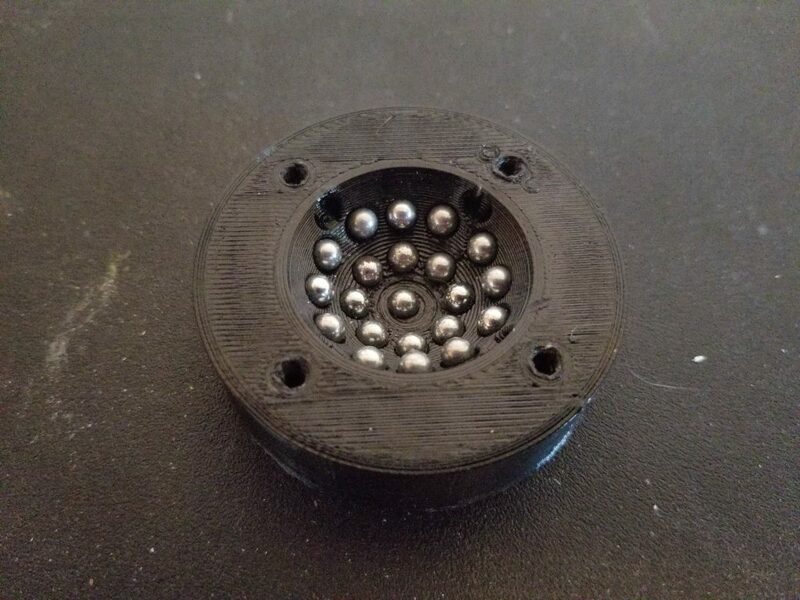 I even tried adding grease to the ball bearings and making the hole in the cap small enough so that the grease wouldn’t come out, but the sphere could still role. I ended up not moving forward with that idea because the smaller hole caused too much friction when it rubbed against the sphere. Parts that didn’t work out for one reason or another. Design with no grooves or pockets. The ball bearings cover the entire bottom, or top, depending on if it’s mounted ball up or ball down. A smaller design my dad suggested that uses several smaller spheres (0.5″) instead of one large one (1″). As you can see, just filling the hole with ball bearings worked out the best. No grooves or pockets needed. 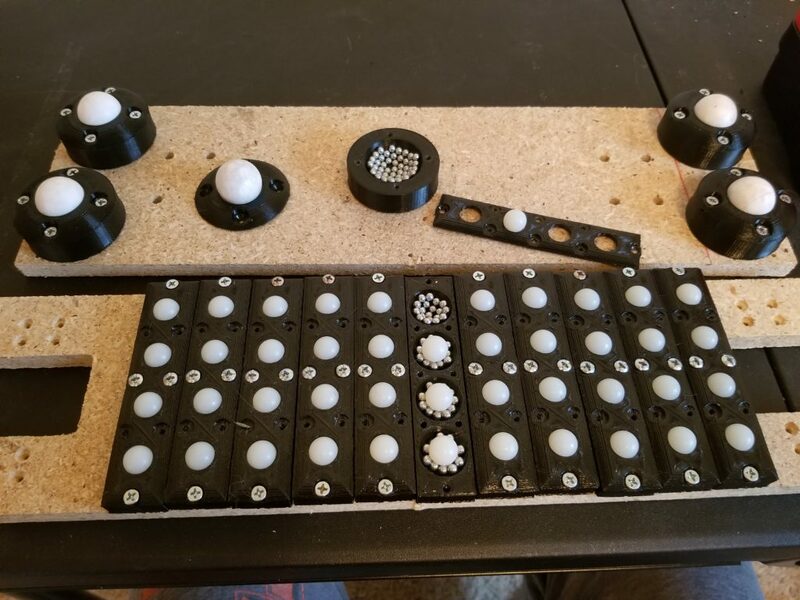 I ended up looking at several different materials to use for the ball bearings and spheres. 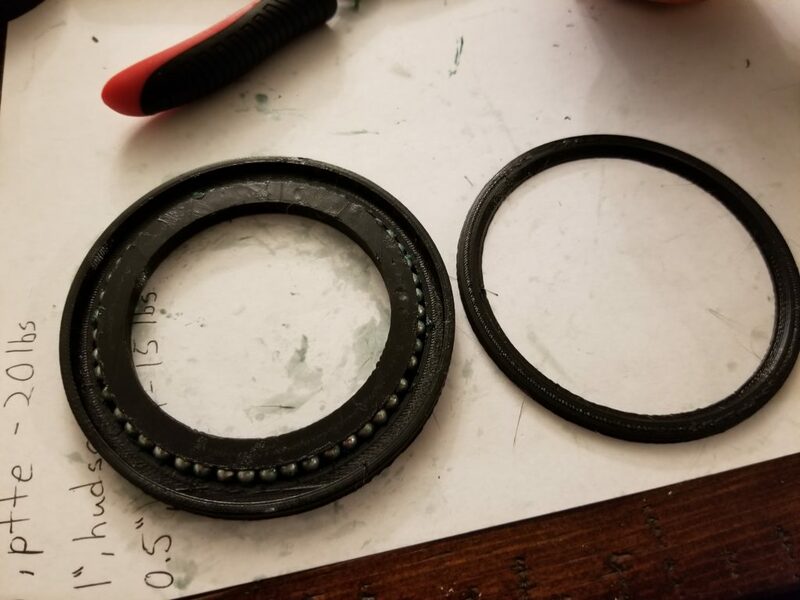 I tried out steel, nylon, ptfe (teflon), and silicon nitride. 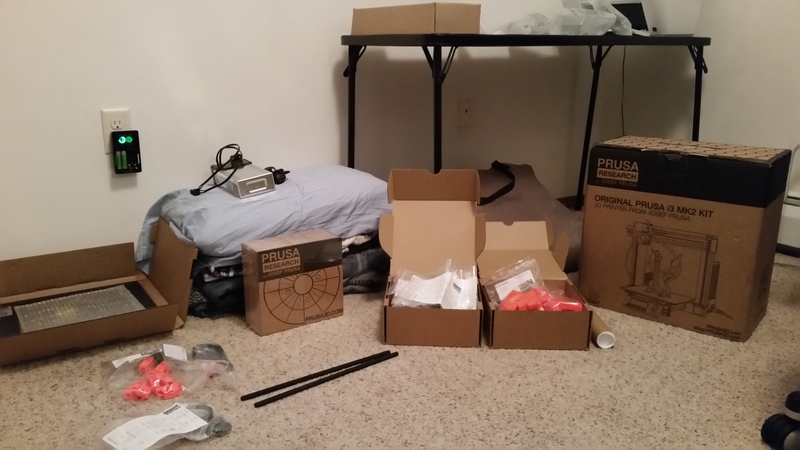 The white 1″ spheres are ptfe. The spheres off to the side are steel. The white 0.5″ balls are nylon. The balls off to the right are steel. steel balls. I used the low carbon ones. 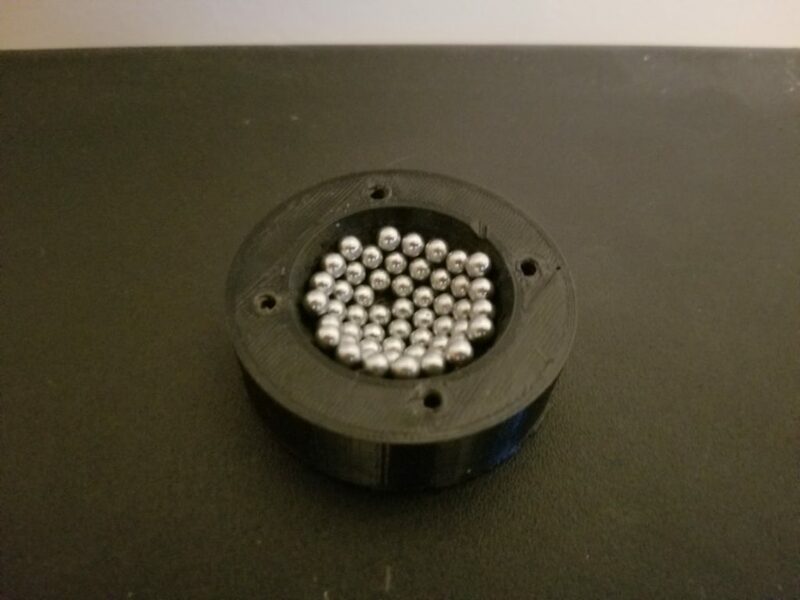 I ended up not doing any testing with the silicon nitride balls . They seemed like they would work well, but they’re just too expensive for what I want to use these for. I bought 2 of them just because I was curious. I wanted to see if the ball transfers I made could handle moving around my own weight. 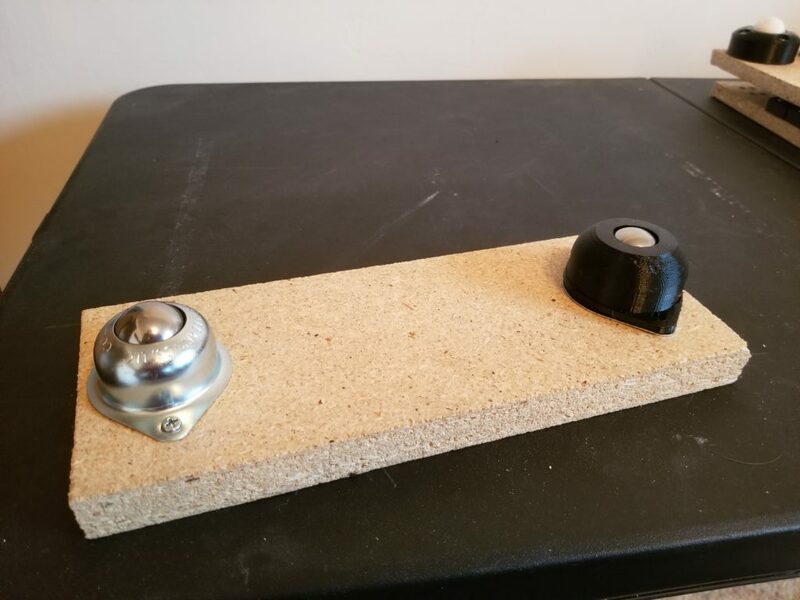 I found some scrap pieces of wood and screwed the ball transfers to them and basically made a skateboard with ball transfer units instead of wheels. 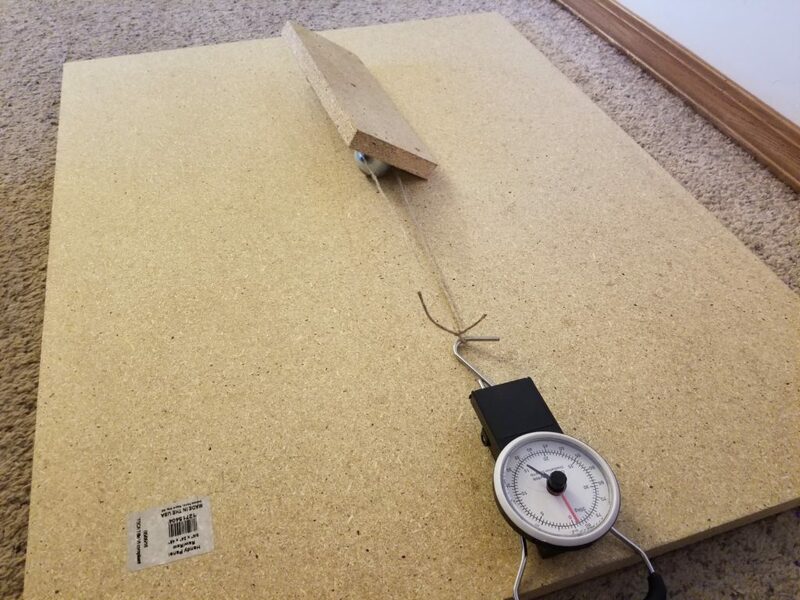 I then found a large, flat piece of wood and laid it on the floor, put my skateboard on it, then tried to push myself along. 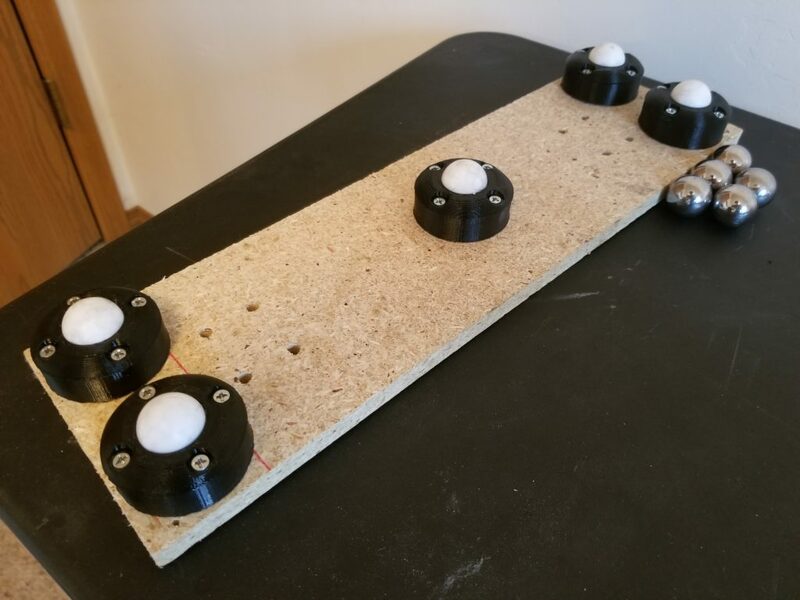 I tried the different designs and different materials and narrowed them down just by how much friction I felt when trying to push and pull the skateboard and by how noisy they were. Through how they felt, I narrowed down the designs and materials I liked. I found that the 1″ ptfe balls felt like they had less friction and where not as noisy as the 1″ steel balls. 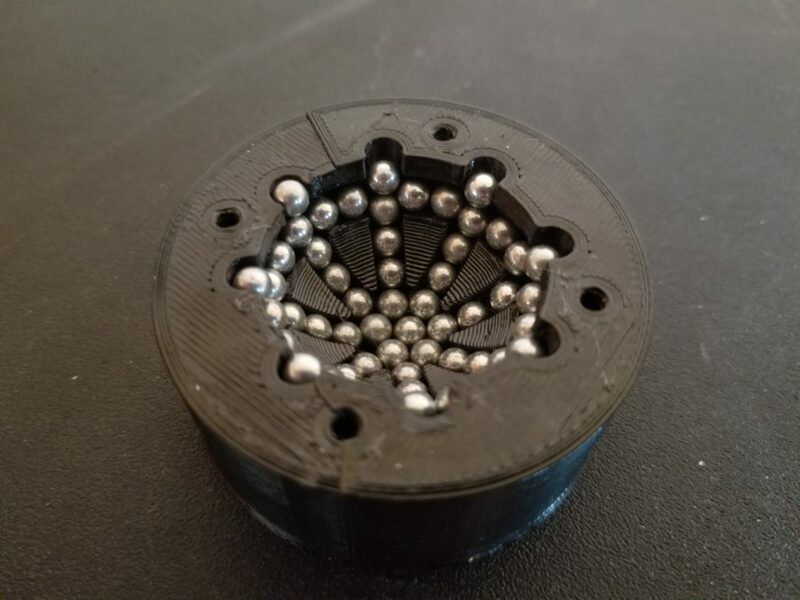 The 0.5″ nylon balls seemed to have about the same amount of friction as the 0.5″ steel balls, but the nylon ones were less noisy. 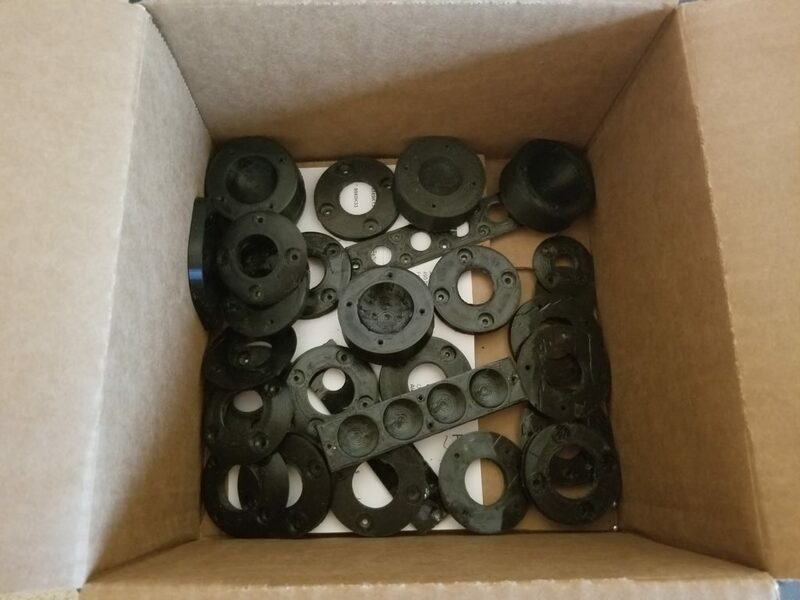 I didn’t order any 0.5″ ptfe balls because they’re too expensive, but I imagine they would work better than both steel and nylon. 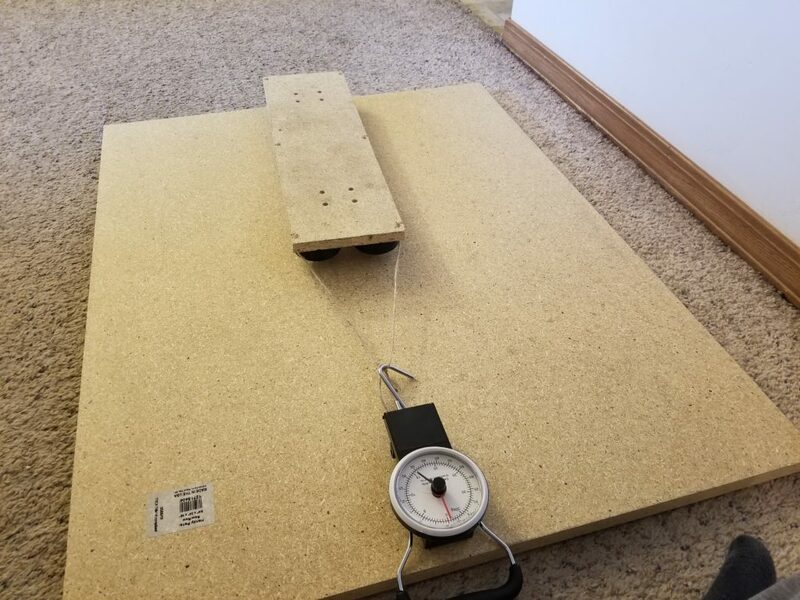 Eventually, I bought a luggage scale and did some testing. Shown in the above image is the skateboard I made that has the 1″ sphere design I liked. The spheres I used i this test were made of ptfe. 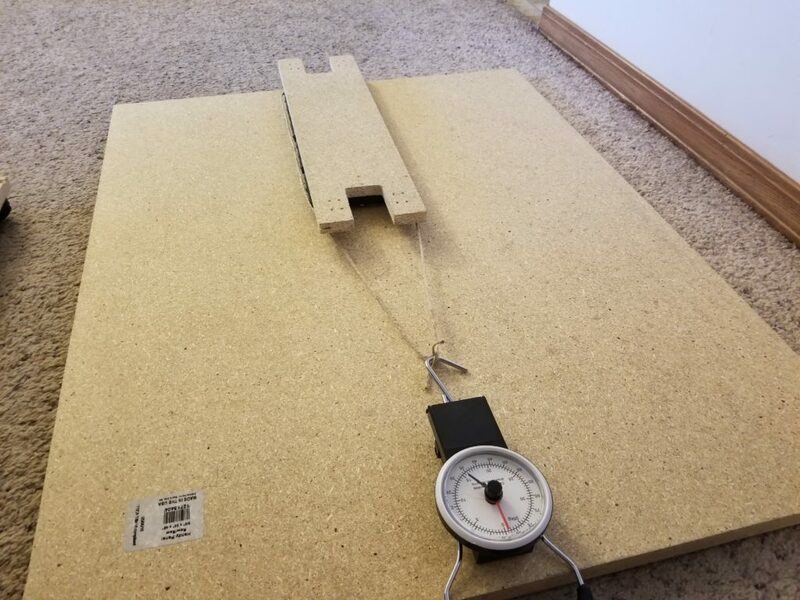 I stood on the skateboard while my wife pulled on the scale until I moved forward. I found that it took about 20 pounds to get me going. After I started moving, it took about 5 pounds to keep me moving. Shown in the above image is the skateboard that has the 0.5″ sphere design. I used 11 of them, so 44 0.5″ spheres in total. The spheres were made of nylon. It ended up taking about 15 pounds before I would start moving. After I started moving, it took about 5 pounds to keep me moving. I could only find 2 of the ball transfers I bought last year from McMaster-Carr. With these, it took 15 pounds to start pulling me. But after the initial 15 pounds it was much easier to keep me going than with my designs. 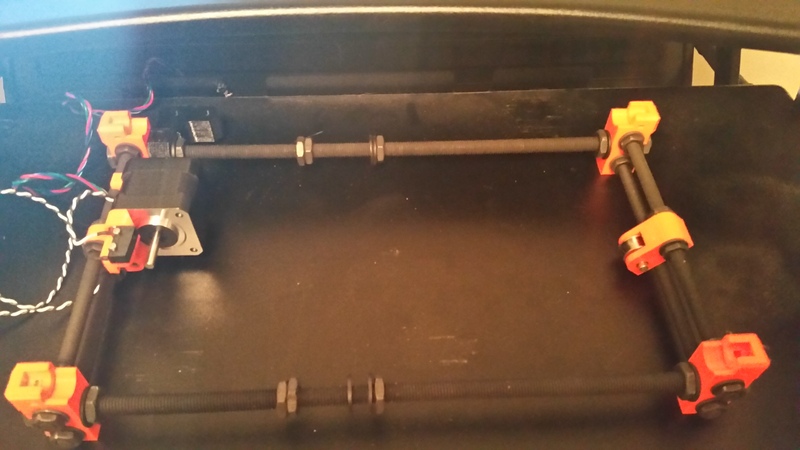 These ball transfers are only suppose to handle a max load of 70 pounds, and I weigh 160 pounds, so I’m sure that these would work much better if I used 4 or 5 of them. I found ptfe to be the best material to use for the 1″ spheres. I’d like to use it for the 0.5″ spheres and the ball bearings too, but at those sizes they’re just too expensive. I found that my design that has smaller and more spheres (44 in total) worked better than my other design that had 5 1″ spheres. Both my designs were much quieter than the ball transfers I bought, but the ones I bought had a lot less friction. Overall I’m happy with my designs. I think I’ll be able to use them in my future projects. In the future, instead of using the 4.5mm steel bbs, I may try to use 6mm plastic airsoft bbs and see how well they work. 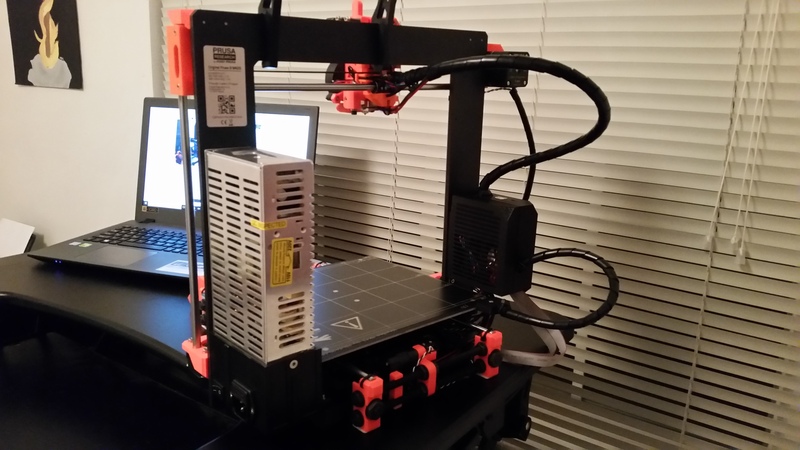 I bought my 3D printer back in January of 2018, about a year ago. 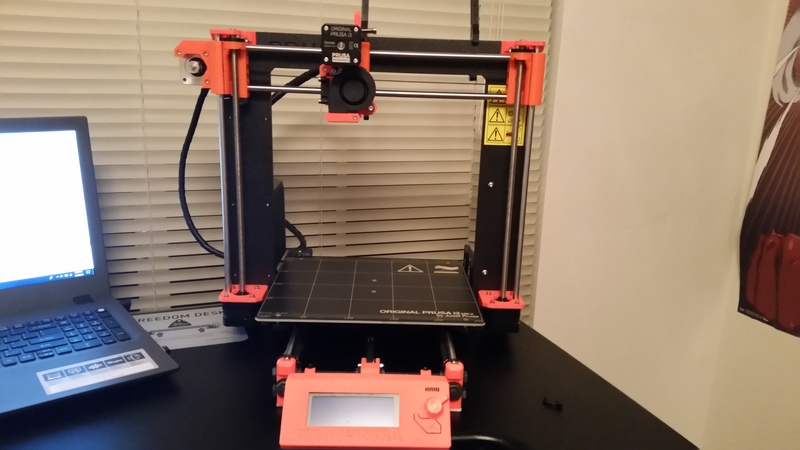 The printer I bought was the Prusa i3 MK2. It’s been a year full of learning. 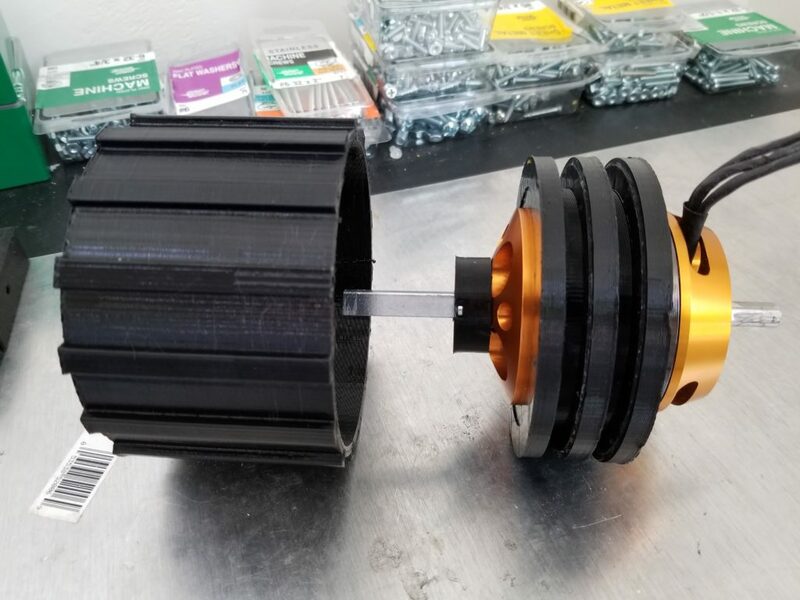 3D printers take time and effort to learn how to operate, especially if you’re printing with several different kinds of filaments (plastics). It’s not like a toaster, where it just works every time and doesn’t require much knowledge to operate. But don’t get me wrong, I don’t think that 3D printers are incredibly complex. Once you learn the little quirks of your 3D printer and find the right settings for each kind of filament it’s not very difficult. And it’s complete worth it to learn if you’re someone who loves to make things. 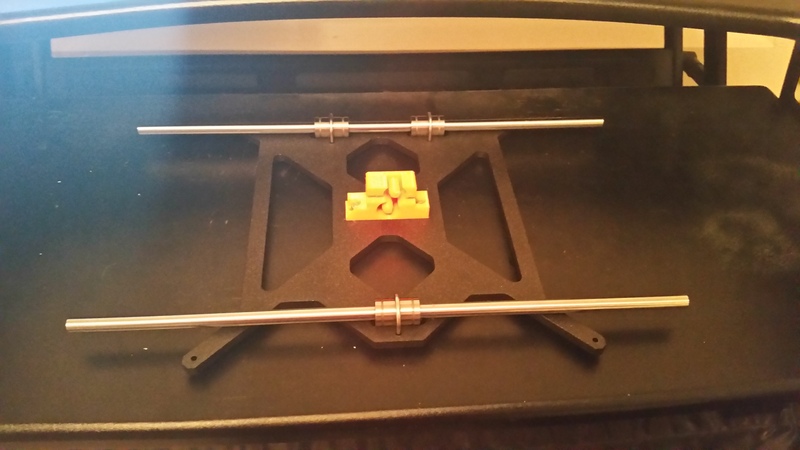 In this article I’ll be sharing the advice I have for making getting into 3D printing easier. I did a lot of research into which 3D printer I should get as my first. 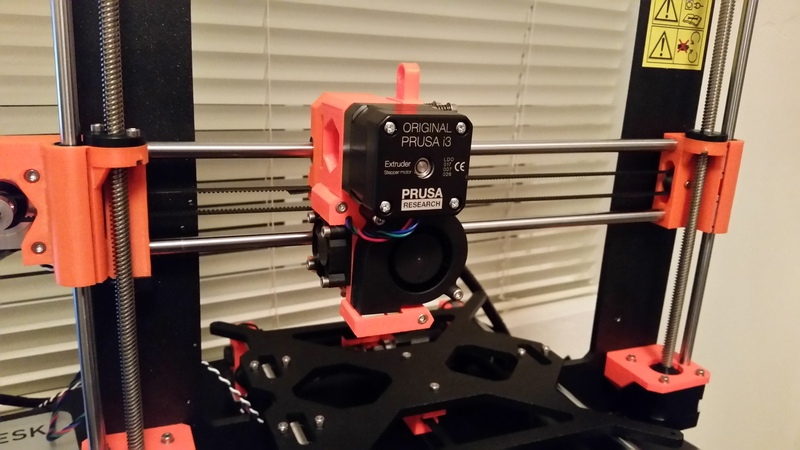 I ended up going with the Prusa because of it’s overwhelmingly positive reviews, it’s auto bed leveling, the wide range of filaments it supports, and the advice I saw over and over is that it’s a good printer for beginners. After over a year of using it I am completely satisfied with it. 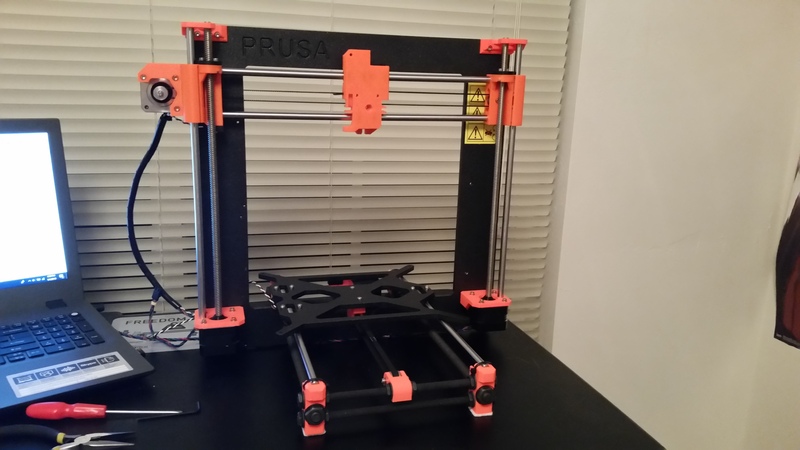 I recommend the Prusa because it has several features that make it easier for beginners. When you first start your printer, you’ll have the printer run some calibrations. 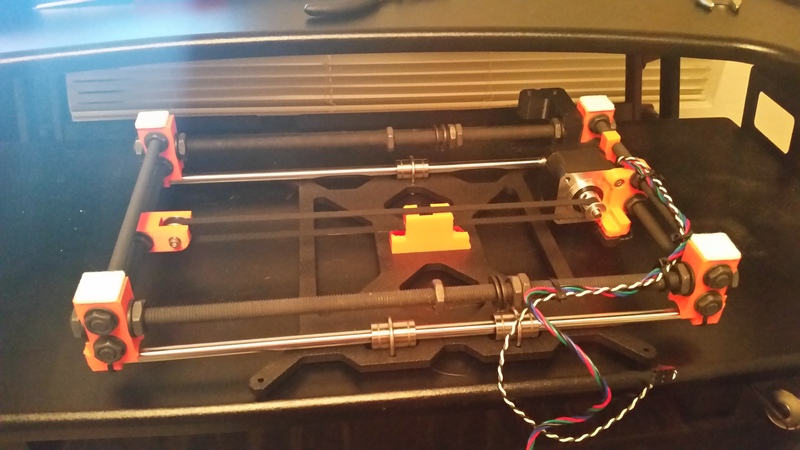 The printer will make sure your bed is level, your extruder is level, and everything can move properly. 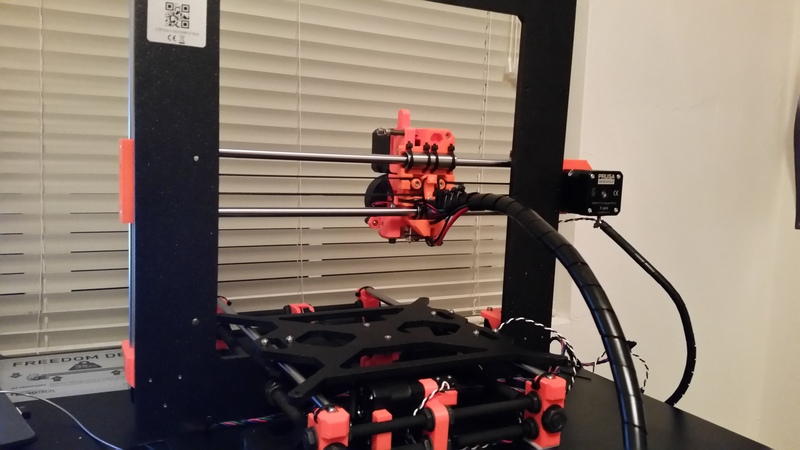 When you start your first print (and before every print), the printer will check how level your bed is. If the bed is slightly mis-leveled slightly off, it will automatically adjust. I bought the MK2, but the MK3 is out now (so you can’t get the MK2 anymore). The MK3 has even more features that make it easier for beginners. 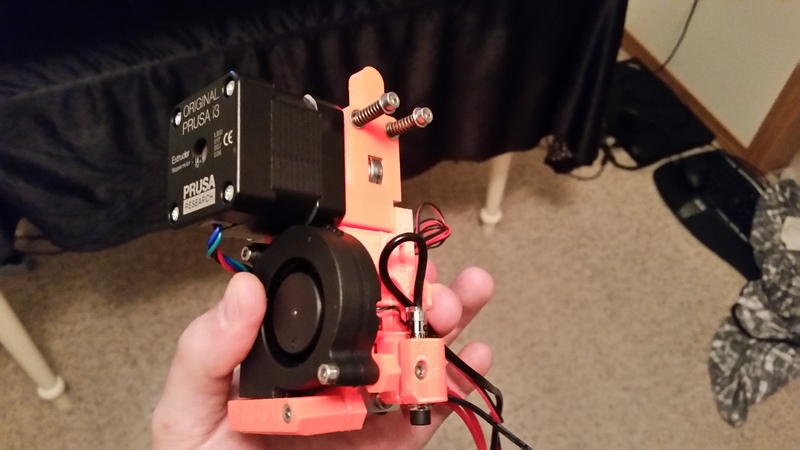 It has a filament sensor, so if you run out of filament in the middle of a print it will automatically stop. Then you can load it with new filament and it will continue the print from where it left off. The MK3 comes with a removable, flexible bed. One problem I constantly deal with is it can be hard to get prints off of the bed. The MK2 comes with a bed that has a PEI sheet on it. Printed parts stick to PEI really well, too well sometimes. Getting prints off can be a challenge. 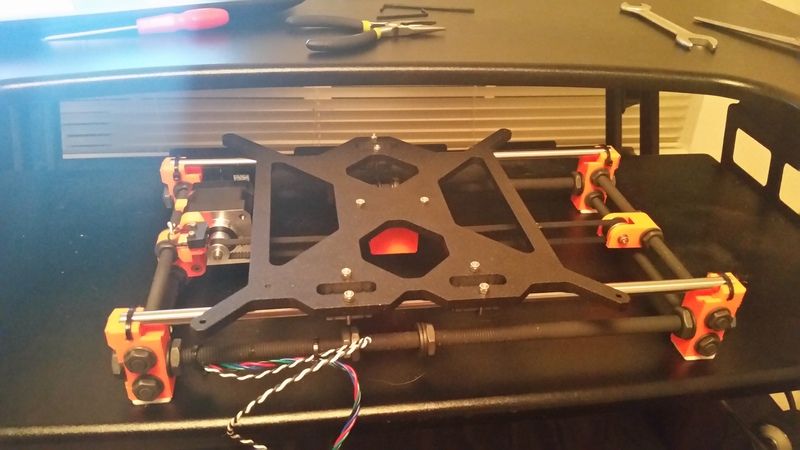 With the MK3’s removable and flexible bed, you can remove the bed when the print is done and then bend it. This will cause the print to pop off. One of my main concerns when researching what 3D printer to buy is how safe they are. I didn’t want my printer to cause a fire. I read that there have been many cases where cheaper Chinese 3D printers have caught on fire. 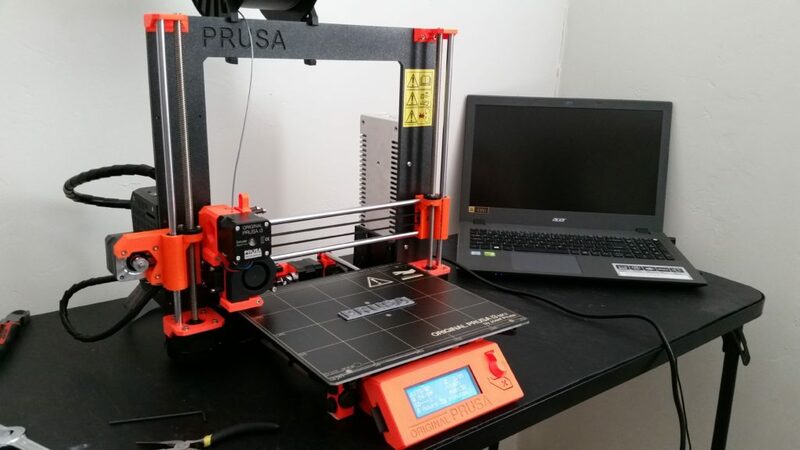 These printers are often clones of other, higher quality printers, such as the Prusa, but assembled with lower quality parts. However, I still haven’t heard of a case where a genuine Prusa printer has caused a fire. 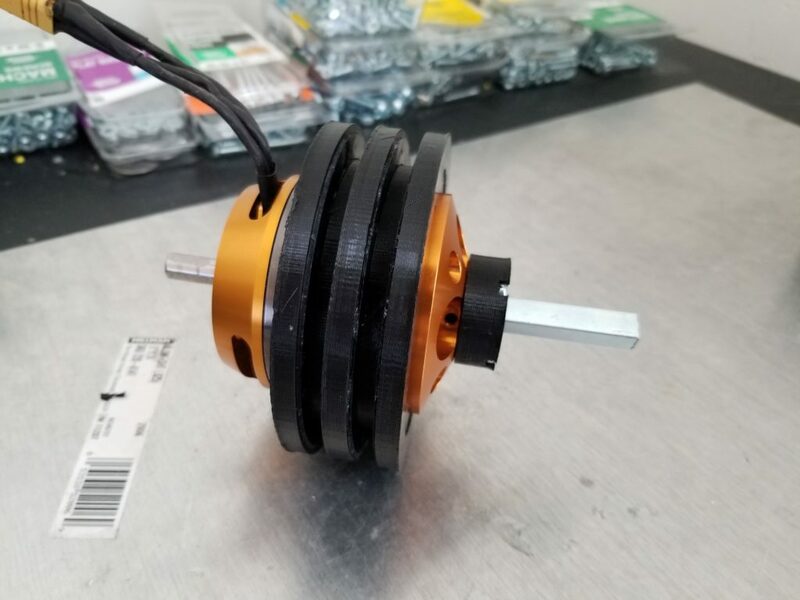 The Prusa software has what’s called thermal runaway protection, which prevents the head block from heating up out of control. Still, even though the chances of it causing a fire are very slim, I still have a fire alarm right above it and a fire extinguisher in the room just in case, and I recommend you do the same. Some people have even installed automatic fire extinguishers over their 3D printer. I also never run the 3D printer if I’m not home. I started running it overnight after several months of running it when I was confident that it would be fine. 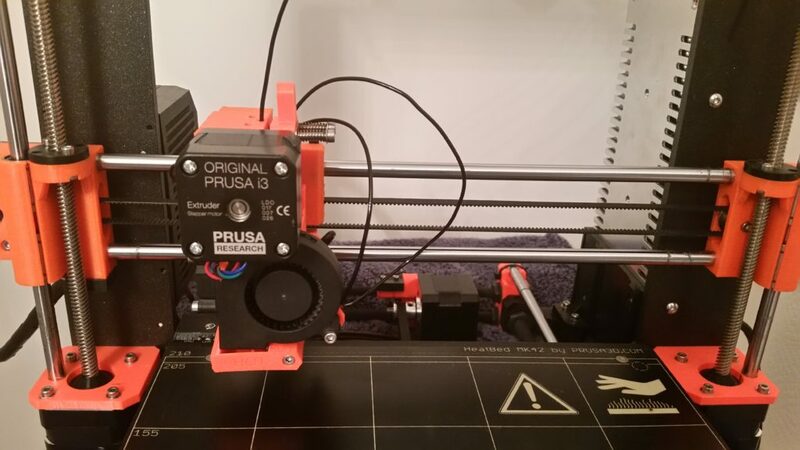 I also recommend the Prusa because it can print pretty much any kind of filament. PLA, ABS, PETG, Nylon, TPU, you name it, the Prusa can print it. 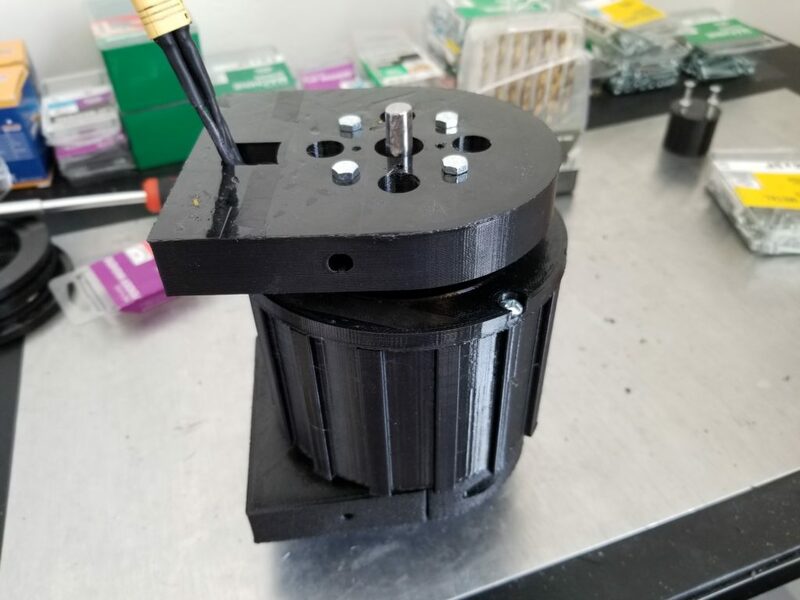 Whatever printer you decide to get, if you have the option of buying it preassembled or putting it together yourself, I recommend that you put it together yourself. As you put it together, you’ll learn how it works. When you run into problems with it later, you’ll have a much easier time troubleshooting and be much more comfortable taking it apart if you need to. 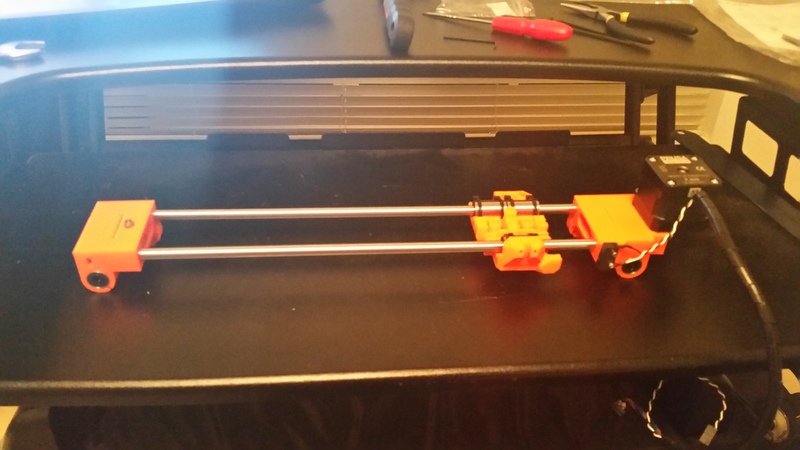 For the Prusa, the instructions for putting it together are very easy to follow. I think it takes most people around 12 hours to assemble the MK2. It took me about that much time. When you start 3D printing you’ll need a slicer program. The slicer contains all of the settings the printer should use when printing the model. 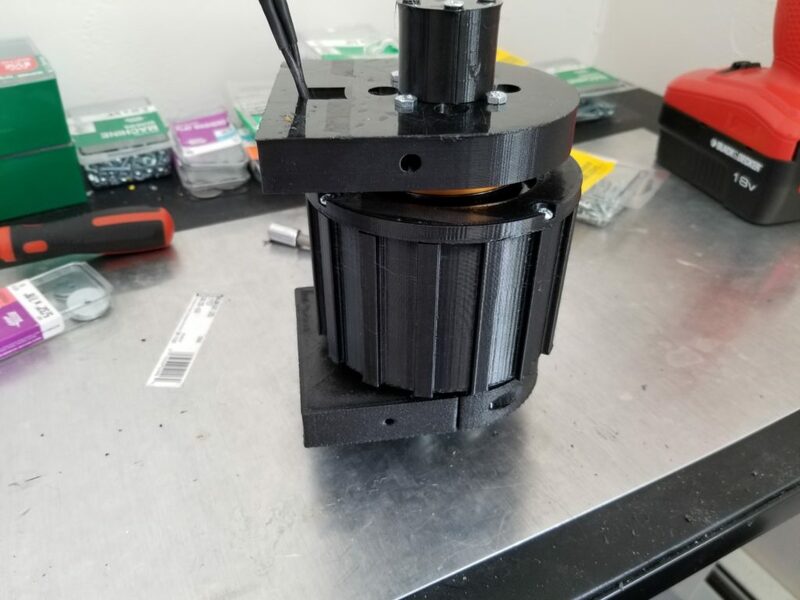 These settings include what temperatures to use for the extruder and the bed, how many solid layers and shells to print, what infill to use, whether to generate supports for overhangs or not, and many other settings. So you’ll open a 3D model file in the slicer, and the slicer will export a gcode file using all your settings and the 3D model file. Your printer will use the gcode file to print the model. The slicer program I use is Slic3r (Prusa edition). With Slic3r, and probably most slicer programs, you can export your settings to a file. When you start printing with different types of filaments, you’re going to have to tweak the settings. 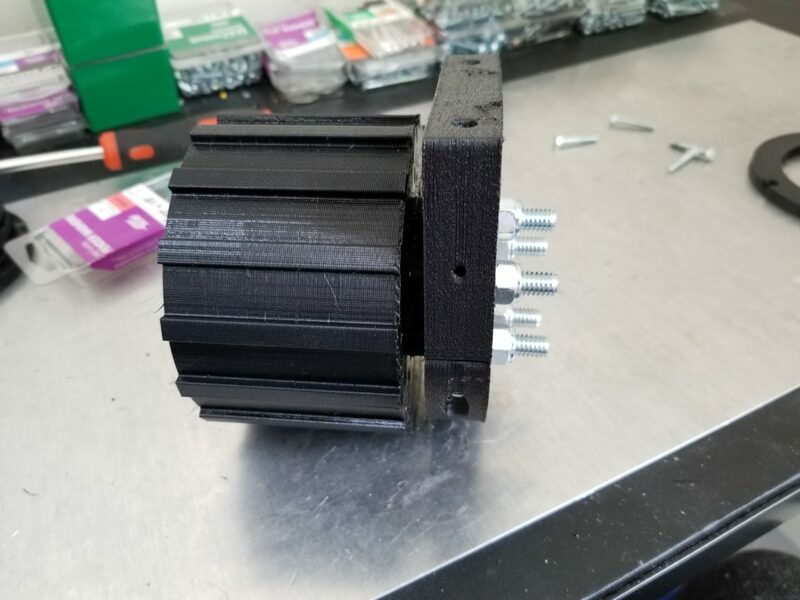 For example, PLA and PETG need different temperatures for the extruder and bed. Once you have settings you like for the filament you’re printing with, export those settings to a file. Import the file whenever you print with that filament. I have different settings files for all the filaments I print with (PLA, PETG, TPU, Nylon). This wasn’t obvious to me when I first started out, but you can store the Z offset in the slicer program. On the Prusa, you can manually adjust the Z offset using the LCD screen. At first I would adjust it on the LCD screen whenever I changed filaments. Don’t bother with that. Just store it in your settings file. The number of layers, shells, and the infill percentage you use will depend on how strong your part needs to be. 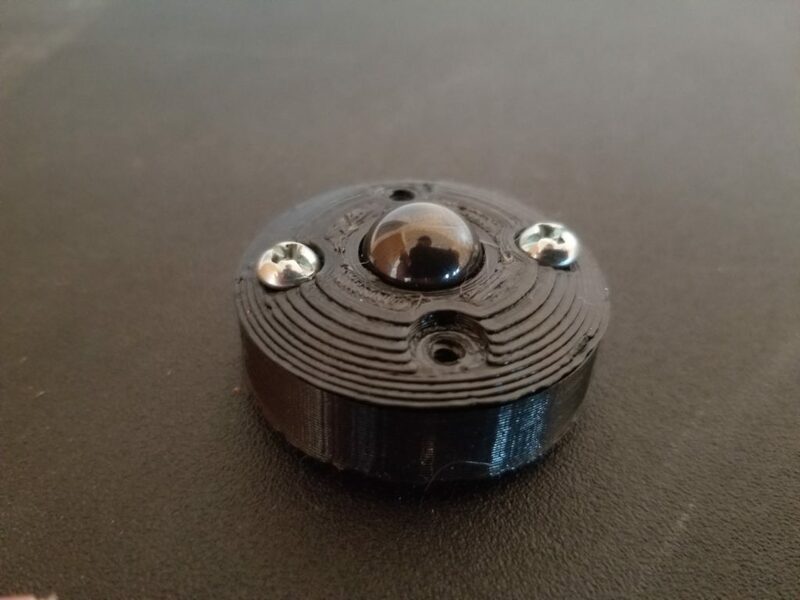 If you’re printing things that don’t need to be very strong, such as figurines and toys, then I think you can get away with 2 layers and shells and 10-20% rectilinear infill. If you’re printing parts that need to be strong, then increase the number of layers and shells. I’d recommend at least 4 layers and shells. Infill doesn’t matter as much. The cubic infill pattern will make the part stronger, so I recommend it. For the percentage I usually use 30%. Thingiverse has 1000s of free 3D models you can download. If it’s something you can 3D print, chances are it’s already on Thingiverse. I’ve downloaded and printed figurines, a sword, gears, and many other things from Thingiverse. If you’re looking for mechanical parts, such as gears and screws, McMaster-Carr is an excellent resource. Most of the items you can buy there have a step file you can download and import into your slicer or 3D modeling software. If you want to make your own 3D models, there are many free programs you can use. Blender, FreeCAD, SketchUp, Tinkercad, Fusion 360, OpenSCAD, and Desigspark Mechanical are all free (or have free licenses). I mainly use Designspark Mechanical because I find it’s interface to be very intuitive and easy to use. For what I need, It works 90% of the time. The other 10% of the time I’ll need to do something that I can’t do in Designspark Mechanical, and I’ll use Fusion 360. All of the programs I mentioned except Blender are meant for designing mechanical parts and machines. Blender can be used for making more artistic models, such as figurines. Many people who aren’t familiar with 3D printing are surprised by how long it can take to 3D print an item. For example, this item took about 3 hours to print. Larger items, like this tommy gun, took over 20 hours to print all the parts. You can tweak your settings to make items print faster, but just know that 3D printing is slow. When I first started printing, I printed with ABS a lot because I wanted it’s strength and heat resistance. I constantly had problems. It smells bad. It needs higher temperatures to print and is known for warping. Warping is where the part, well, warps, because of heat differences in the part. The bottom of the part will be hot because it’s touching the bed. The top of the part will be hot because it just came out of the extruder. The middle of the part will be colder, which will result in warping. Most people recommend having an enclosure around your 3D printer if you’re going to print with ABS. 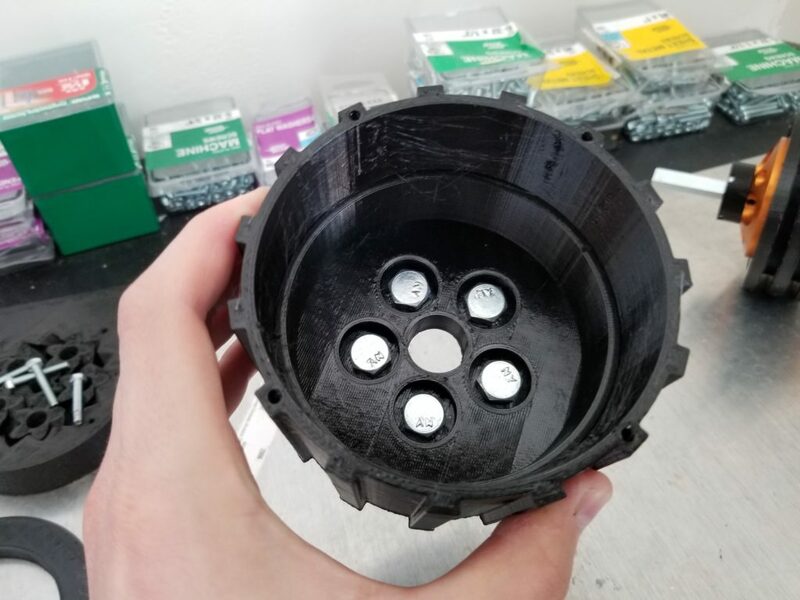 The enclosure will trap heat so that the part doesn’t get as cool, resulting in less or no warping. 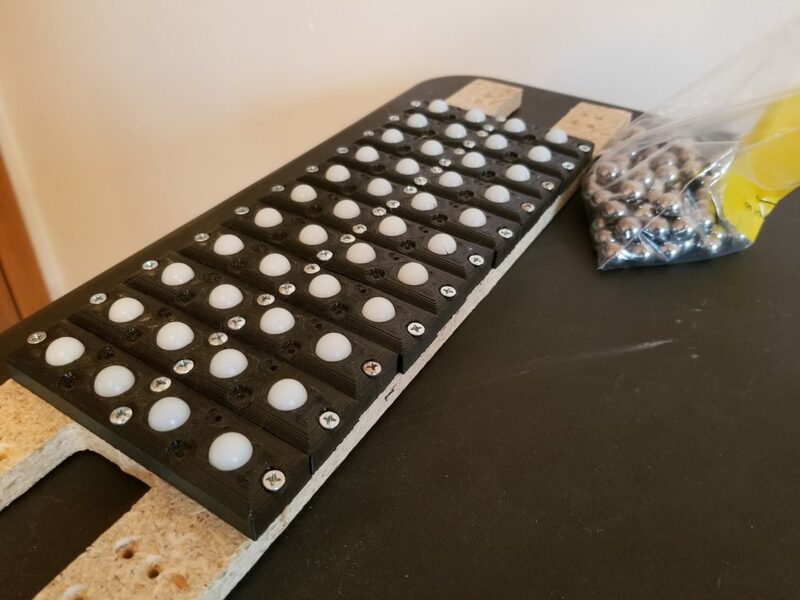 I’ve seen many images of enclosures people have built for their 3D printers and read logs of guides and forum posts about it. The problem I have with making an enclosure is that it’s recommended that you move the electronics outside of the enclosure, because the extra heat can damage the electronics. Moving them just sounds like a hassle to me, and I just don’t want to take the time to build one. Plus, many DIY enclosures are made from wood, so if the printer ever actually does catch on fire, there’s now a lot more material to burn. If I ever do get an enclosure I’ll probably buy a metal server rack. Instead of building an enclosure, I tried a quicker solution. I set up a heat lamp so that it pointed at the print. I hoped the heat lamp would keep the part hot enough to prevent warping. It worked very well to prevent warping. 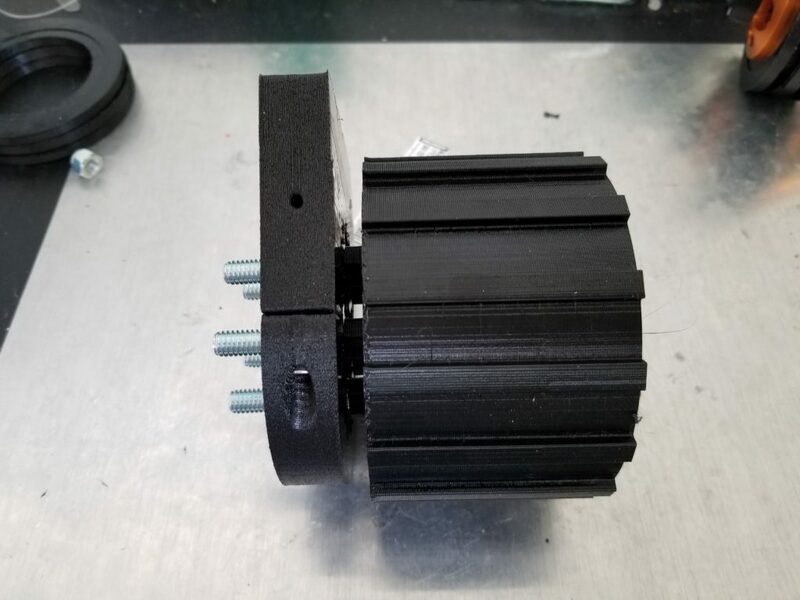 A friend of mine recommended trying PETG, since it is similar in strength to ABS but can be printed at lower temperatures, doesn’t smell, and isn’t known for warping. I got a roll of Amazon Basics PETG and was amazed by how easy it was to print with. I haven’t had any problems, including warping, with PETG. PETG is now my go-to filament because of how easy it is to print with and how strong it is. TPU is a flexible filament, meaning that the parts you make with it are flexible. Printing with it can be a challenge because of how flexible it is. You may find that it has problems where it gets tangled up, oozing, stringing, and prints getting stuck to the bed. I recommend following the advice in this video from Maker’s Muse. After following that advice and doing a little bit of tweaking with the extrusion multiplier I was able to easily print TPU. However, I still continue to struggle with one problem, and that is that TPU sticks too the PEI bed too well. It sticks so well, that it ripped several holes in my PEI sheet. Advice I found online suggests to spray window cleaner on the bed, which is supposed to make the TPU not stick as well to the PEI, but it didn’t seem to work well for me. I also recently found advice to use a glue stick instead of window cleaner. I haven’t tried that yet. What I found works for me is to put some Kapton tape on the bed. The TPU sticks just well enough to the Kapton tape to keep it on the bed, but not so well that it’s difficult to get off. Still, sometimes the tape rips, but it’s better than the PEI sheet getting ripped. Kapton tape also sticks well to the other filaments I work with, even Nylon, so I decided to just cover my bed with it. I’ll probably just leave the tape on my bed until I decide to upgrade my printer so I can get the removable and flexible bed. You should keep your failed prints and keep them separated by filament type. Filament extruders, machines that allow you to recycle filament, are getting cheaper. Take a look at this video from CNC Kitchen to learn how you can get started. Like I mentioned above, you can use Kapton tape to cover holes in your PEI sheet. Take a look at this video from CNC Kitchen to learn how. You can replace the PEI sheet. You can find replacement sheets on Amazon. Follow the guide in this video from SBS Extensions to replace the sheet, which involves removing the bed. If you don’t want to replace the bed you can follow this video by Chris Riley. However, I’d recommend that you not use acetone like he does in the video since it can melt the 3d printed parts on your printer. Use something like Goo Gone instead. There are lots of great resources out there to learn about 3D printing. I mostly watch YouTube videos about it. Here are the channels I recommend.